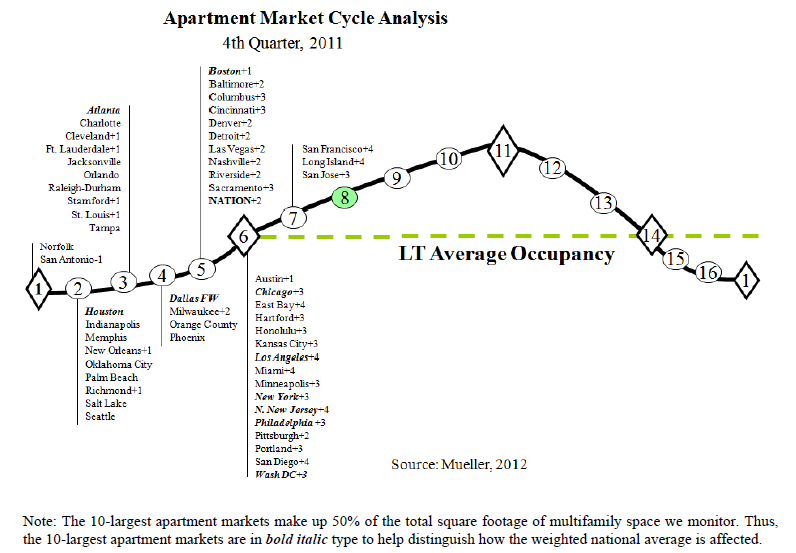 Is the Dallas/Fort Worth Apartment Building Investment Cycle Peaking or just taking a breather? “Apartment leasing in Dallas-Fort Worth dipped for the first time in over two years. Net leases fell by 270 during first quarter 2012, with most of the declines occurring in the northern suburbs. Greg Willett of apartment analyst MPF Research believes the slight dip is nothing to worry about. The North Texas area has added about Continue reading Is the Dallas/Fort Worth Apartment Building Investment Cycle Peaking or just taking a breather? Posted on April 6, 2012 April 6, 2012 Categories Apartment Building Investment Cycle, Multifamily InvestmentsTags Apartment Building Investing, Apartment building investment, apartment building investment cycle, apartment demand, apartment market cycle, investment property, supply, trends1 Comment on Is the Dallas/Fort Worth Apartment Building Investment Cycle Peaking or just taking a breather? Posted on March 5, 2012 October 27, 2014 Categories Apartment Building Investment Cycle, Commercial Real Estate, Multifamily InvestmentsTags Apartment building investment, apartment investments, apartment market cycle, multifamily, multifamily deals, trends1 Comment on Where is your apartment market in the cycle? 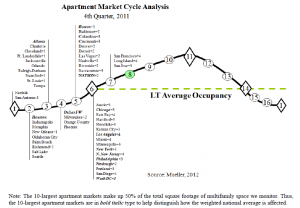 Latest Multifamily Market Cycle Charts now posted via Glenn Mueller, PhD.